Long hours of grueling drill and practice is not needed to be acclaimed as one. Rehearsals would virtually be impossible if it would involve the whole population of a nation. What’s simply needed is the devoted and enthusiastic ‘heart’ of everyone. I am talking about the Philippines being awarded as the Most Valuable Fan – Best Country category in the recently concluded FIBA Basketball World Cup held in Spain. 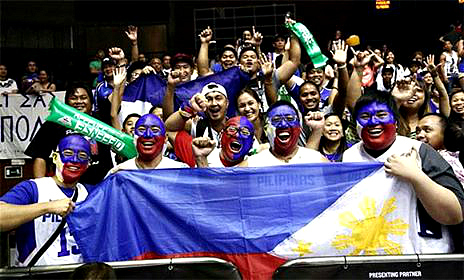 I guess this is the first time in more than a lifetime that organizers of FIBA Basketball World Cup saw for themselves, how Filipino fans cheered in full thrill and hysterics. I am supposing that these organizers do not watch the annual Ms. Universe pageant where Filipino viewers would elicit similar fits of frenzy and hysteria. Considering that at the start of the game, it has been predicted that the Philippines will most likely not gonna win any game, I was not surprised that still cheering was like a party for every Philippine game. This is simply because Filipinos are mad about basketball. FIBA officers must have been told that the cheering shindig does not only happen inside the venue. The immeasurable passion of the Filipinos are present at every household in the Philippines making the country deserving such an award. The recognition actually seem so hollow and futile that other countries must be laughing at us because of such a silly consolation. Yet I and my fellow noisy bunch of Filipinos feels so proud and honored. This is simply because we are so in love with the sport.